Audi A6 will get all the technology of its bigger brother, the A8. 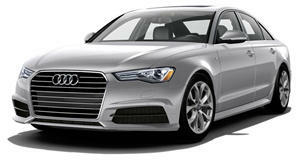 The battle for German midsize luxury sedan supremacy has traditionally resulted in the Audi A6 placing third on sales charts against the and . While the current sales order is unlikely to change, the automaker from Ingolstadt has high hopes for its next-generation sports sedan. After three years of steadily declining sales, Audi is prepared to sell more A6s than it has since 2002, even amidst ever-increasing SUV popularity. At the , Anthony Foulk, Audi of America's product manager for the A6, explained just how bullish the company is on the new sedan. “[The A6 is] clearly still very important. The market overall has been expanding for the past few years. SUVs are expanding more than sedans—yes, we know that—but the sedan is still quite big. It’s just not growing as fast as the SUV market,” Foulk said. “We still expect to sell 25,000- A6s next year.” Were Audi to sell above 25,000 copies of the new A6 during its first full year on sale, it would be the model's most successful year since the company sold over 30,000 units in 2002. In 2017, Audi sold just 16,304 A6s, a number vastly overshadowed by the ' 40,658 sales and the ' 51,312 notchmarks. Even the widely panned eked out more sales than the A6, finding 27,387 driveways in 2017. Part of its sales slide, which began in 2015, can be attributed to Dieselgate, but that alone doesn't entirely explain the model's decline. “A little bit of it is cyclical—life cycle. We do expect with the new car that we’ll have a big bounce back like we did with the previous generation. We come to the market with what we believe to be the sportiest, the best looking, and the best-performing car,” exclaimed Foulk. The A6 won't rely on just a new infotainment system to put customers in seats, though. “For mid-$50,000, you can get a sedan that has all the technology that’s in the A8—and it’s some of the best technology in the industry. It’s all of our technology. There’s nothing less in the A6,” Foulk said. The most notable technology in that suite is LIDAR, which will give the A6 a hand up over competitors when it comes to driver assist functionality, especially as automakers push their way closer to full autonomy. The new 2019 Audi A6 will go on sale powered by a V6 turbocharged engine and standard 48-volt mild-hybrid technology later this year.